I am thrilled you’d like to link to Ask Saltwater Fishing from your website! There are a ton of saltwater fishermen out there who have a lot of questions, and just can’t seem to catch saltwater fish like their buddies can. By you placing a link on your site, you’ll be giving this helpful website more exposure, and your web visitors will love you for showing them a place they can ask any question about saltwater fishing. There are 2 really simple ways to link to my website here. your specific situation. All you have to do is Ask! Ask any question you have about saltwater fishing. From bait, lures, location, and what makes ‘em bite – Dan’s got the perfect answer for your specific situation. All you have to do is Ask! 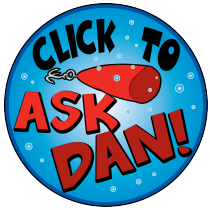 Ask Dan About Saltwater Fishing – Do you have a question about saltwater fishing? Just ask Dan! Thanks so much for helping me get found on the web!